There is nothing like the nostalgia of a 100 year old steam engine in action, but add in the fact that the entire train is decorated with bright Christmas lights and you have magic! This is the atmosphere that the Tweetsie Railroad theme park has created to give your family a true holiday experience for all ages. A night-time ride through the Blue Ridge Mountains on a lighted train is exciting on its own, but when you can sit in an open train car and take in thousands of sparkling Christmas light displays while bundled up with loved ones singing Christmas carols, it brings the whole experience to another level. 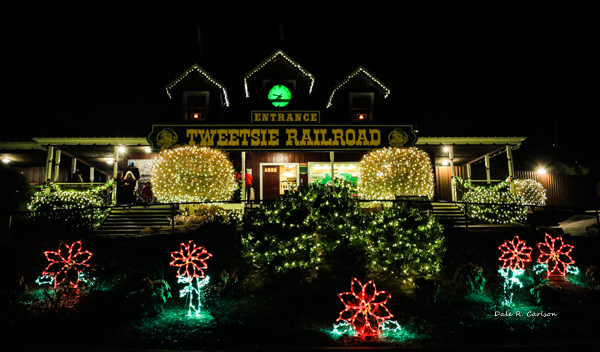 As the Bluemoonistic Team boarded the train with excited, bouncing children, grandparents in lighted Santa hats, and Tweetsie RR Conductors in elegant 18th Century attire, we saw nothing but a sea of smiling faces. The stresses of our lives did not exist in that world. Nostalgia is a wonderful thing but the best part was seeing what it did for everyone in the here and now! From the minute you enter the grounds you know you are in for a holiday treat. It's a short 20 minute ride so we didn't even notice the cold. The piped in Christmas music with the words on the TV screens offered a variety of cheerful voices. A little boy in the seat behind us must have said "Lookie Daddy" a gazillion times and it gave us smiles thinking back to days when our son did the same thing. There were young lovers bundled up in blankets, older couples holding hands and, of course, the modern day phenomenon of hundreds of phones snapping selfies. While waiting to board Dale was naturally taking lots of photos and of course his cell phone never left his pocket. The steam and lights on the train and tracks in the photo below captures the enchantment that he feels for trains. Here is just a small taste of the sights and sounds we saw as #12 pulled out of the Tweetsie Station for you! To make your experience even better there is a Christmas tree lot right in the Tweetsie parking lot so you can pick out the perfect Christmas tree for your family before you head home. Our own locally owned tree farm, Hart-t-Trees, from Ashe County NC is there to offer you a fresh cut tree in any size that will definitely keep the season real! Tweetsie Railroad is a family oriented theme park in Blowing Rock, NC that has been operating since 1957. It offers wild-west entertainment that has kept families coming back generation after generation. The Christmas train ride is a first for them this year and we happen to believe it will indeed become another family tradition far into the future. Thanks for the memories from the Bluemoonistic Team!